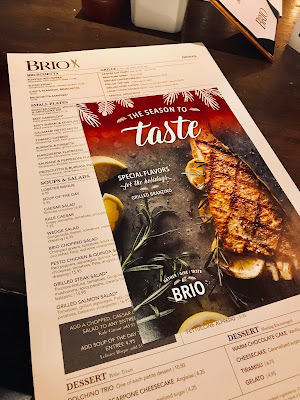 At BRIO Tuscan Grille it’s the season to gather, give, and taste! This month, BRIO is offering a special festive menu with unique holiday drinks, giveaways, and other extras for the holidays, so dine in now for these great deals and meals. We celebrated the start of December at the Waterside Shops restaurant in Naples with a lovely date night. BRIO’s “12 Days to Win!” Facebook and Instagram contest gives fans a chance to win various prizes from Monday, Dec. 4–Friday, Dec. 15. They will post a different question regarding the holidays each day on their social channels. Those with winning answers will receive incredible prizes such as gift cards, brunch for six, a chef’s dinner, a Happy Hour party for 12, and BRIO for a year (a $1,200 value)! So, be sure and enter. I will be. Good luck! How beautiful are these winter-inspired cocktails? They are essentially a liquid dessert with a kick! Or buy a gift card for yourself and give the bonus one as a gift. From Monday, November 13 – Saturday, December 30, BRIO guests will receive a $25 bonus card with every $100 in gift cards purchased. Make your list, and check it twice! The special seasonal two-course menu includes a soup or salad and a selection of entrees. We tried the Grilled Branzino with roasted red & gold beets, farro, Marcona almonds, marinated kale, lemon vinaigrette, feta and Surf & Turf: 14-oz. strip steak, black pepper shrimp, Yukon Gold mashed potatoes, grilled asparagus. Both were exceptional. The skin on the Branzino fish peeled off easily and was light and fluffy. The beets were also cooked to perfection. The portions are large too, we couldn't finish them. Also, they now have a new menu addition the Shrimp Scampi Appetizer with five butterflied jumbo shrimp stuffed with scampi butter, diced tomatoes, lemon butter sauce and basil. It's soooo good. Even after we ate all the shrimp, we sopped up the delicious garlic juice with the accompanying ciabatta bread. There are 14 BRIO locations in Florida and can be found in 21 states. Find a location nearest you. Disclaimer: I received a complimentary preview of the new holiday menu in exchange for my honest review. I was already a fan of the restaurant though.